What a glorious weekend at the beach! We stayed in Oceanside at a friend's cabin, and enjoyed every kind of weather - sideways rain and spectacular sun. The northern Oregon coast is a powerful and beautiful place. It was very nostalgic for me to visit some of the places I remember from this area: Netarts specifically. I spent a couple of summer weeks there as a boy... and Cape Lookout where I did Boy Scout camp and, as a freshman in high school - I rode my bike there from Portland (reach the Beach!) with the Grant High bike club. ... but the beach worked its magic, and I feel better for being there. So I only have one more radiation session - tomorrow (Monday Feb 22nd)! I've been tolerating it pretty well, but, this week it seemed to catch up with me. I feel like my temples are sunburned and, my eyes are scratchy and sore. So, I think it is high time to quit! (I will miss the nurse mannequin - pictured above - the staff place her around the radiation facility... and this day she was working on the puzzle). I have enjoyed this incredible spring weather though. I spent most of the weekend doing yard work and garden projects. Good life affirming energy to just dig and build and plant. You can never hold back spring! Feb 22 LAST day of radiation treatment! Feb 26-28 Mark and I go to the Oregon coast for a 3 day get-away! Mar 23 Grinnell College Singers in Portland during NW tour; Kelly and friends staying with us! Somewhere during March Mark also has to have a bone marrow sample taken (ouch). While Mark completes his last few radiation treatments, I am stealing away for a quick visit with Kelly and Claire. I fly to Minneapolis Wed. to spend 2 nights at Carleton, and then Claire and I drive about 4 hours south to spend 2 nights with Kelly in Grinnell, Iowa. I am packing plenty of outerwear in preparation for frigid temperatures, in contrast to Portland, where the crocus and daffodils are blooming! Mark and I thought it was "blog-worthy" when we realized, driving to the radiation treatment this morning, that today on 2-10, 2010 Mark has 10 "zaps" down and 10 "zaps" to go: 2 x 10 = 20. Maybe we should buy a lottery ticket today! These pours are perfect. Somebody say Amen! Mark has had six rounds of injections of chemo-therapy into each eye, and an expectation of getting them every month throughout 2010. However, the GOOD NEWS today from Dr. Lo (the eye guy) is that the radiation Mark is getting to the eyes makes the injections no longer necessary. That's better than a poke in the eye! Mark will see Dr. Lo again in 3 months. 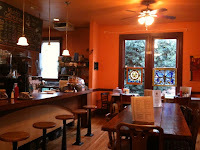 Also, the cherry walnut scone this morning at Coffeehouse Five was terrific. And it was sunny outside! Altogether, a good day. Our super-cool neighbors - Karla and Scott - recommended/loaned us a DVD that they got from the library about this artist - Andy Goldsworthy. The name of the DVD is "Rivers and Tides". It's fascinating. We are all "working with time" and this video and this person are a great reminder of how we walk through this world briefly - but that our actions, and even our intentions, are permanent , and part of the whole. Today we got some new information from Mark's team of doctors. The somewhat discouraging news is that Dr. Maziarz (the "bone marrow transplant" or BMT guy) wants to collect more bone marrow stem cells from Mark before the transplant. During the 4 days that Mark was connected to the collection machine in early January (3 hours each session), 1.95 million stem cells were collected and Dr. M likes to have closer to 2.5 million stem cells. We had been under the impression that Dr. M thought the 1.95 number was "close enough", but apparently not... Mark's typically upbeat response was "we might as well top up the supply while we can." Mark's last radiation treatment will be Feb. 23, and the protocol is to wait a couple weeks for recovery before the collection. So, Mark will have 5 daily shots of Neupogen starting March 12, and report for the collection process on March 16 and perhaps again on March 17. He will be admitted to OHSU at the end of March (that's Oregon Health & Science University) , and remain in the hospital 3 - 4 weeks for the actual bone marrow tranplant. Before that, Mark will have a Muga (heart) scan, Pulmonary function test, PET scan and another bone marrow sample (that's the painful one). Those remain to be scheduled. Mark and I will attend a 2-hour class about the BMT at OHSU for patients and caregivers on March 3. The barrage of procedures continues. 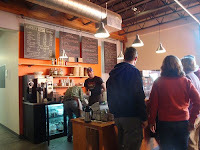 But so does our project to visit a new coffeeshop almost every day after radiation! See Mark's summary below. Recent reviews by Mark B.
Woops! 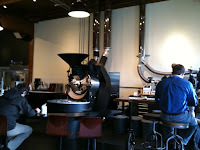 Ended up back at Madrona Hill Cafe! So Where should we go next week? So this is the machine that I visit every morning to get radiation treatment. Pretty impressive eh? 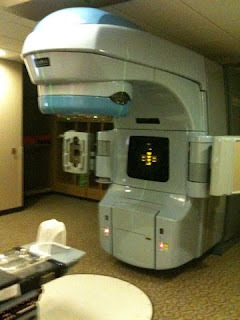 It is used for all kinds of radiation - but is customized for each patient with software that directs the beam and intensity of the rays according to specific parameters designed by the Radiation Oncologist, Dr Johnson. The staff here are great - Dave, Matt, and Rhonda. Very competent and friendly. This guy's gone through a lot and writes well about what it is like to go through the fear and uncertainty..... And he's my same age - gulp!